Dorm Co. Tip: Cook more than Ramen in your dorm room! Just because you're living in a dorm room doesn't mean you have to eat Ramen Noodles for dinner every night. You also don't have to be stuck with college cafe food that may or may not be good. However, even if your college cafe food is good, you're going to want other options. Plus you may just want to eat dinner quietly in your dorm room while you study or relax and watch TV. You don't have to be stuck with Ramen or Macaroni and Cheese just because you have a small dorm room and only have access to your dorm microwave. Expand your dinner and lunch options with the right dorm essentials like our Mini Microwavable Steamer. 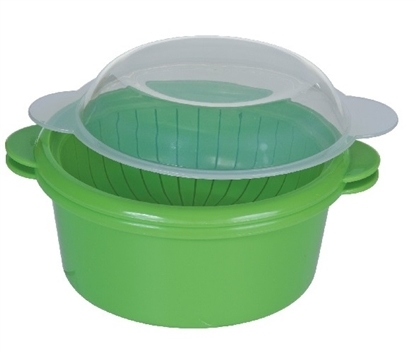 Our Mini Microwavable Steamer is a two cup steamer that you can use right in your dorm microwave. This dorm necessities product allows you to steam fresh or frozen vegetables right in your dorm microwave. When combined with other dorm essential cooking supplies, you can cook a delicious and healthy meal right in your college dorm room. Have veggies as a side with other food you've made in your cooking items! And if you're really set on eating Ramen but want something a little more with the Ramen for it to be filling, you can have veggies as a side or on top of your Ramen. With cheap dorm supplies like our Mini Microwavable Steamer, you can have a variety of delicious food right in your college dorm room!